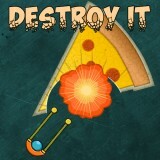 In this game you are going to destroy everything you will see. Use the mouse to play and be sure that you will spend some of your free time with pleasure and satisfaction. Just enjoy this game right now and you will have so much fun here.